This section on C questions and puzzles focuses on “Mathematical Functions”. One shall practice these questions and puzzles to improve their C programming skills needed for various interviews (campus interviews, walkin interviews, company interviews), placements, entrance exams and other competitive exams. These programming puzzles can be attempted by anyone focusing on learning C Programming language. They can be a beginner, fresher, engineering graduate or an experienced IT professional. Our C questions come with detailed explanation of the answers which helps in better understanding of C concepts. 1. What will be the output of the following C code? 2. What will be the output of the following C code? 3. function fabs defined math.h header file takes argument of type integer. 5. What will be the output of the following C code? 6. What type of inputs are accepted by mathematical functions? 7. 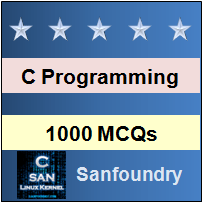 In linux, apart from including math header file, the program is successfully executed by which of the following? 8. Which of the following is not a valid mathematical function?